Stating the problem. In Uzbekistan organized the production of a fundamentally new kind of active mineral additives to cement, called «Fosfozol», which is obtained by hydrothermal treatment under pressure of mineral compositions including phosphogypsum and ash and slag at a certain mass ratio. It is expected that with the introduction of additives «Fosfozol» in cement, formed during the autoclave processing of the mixture of ash-slag and phosphogypsum hydrated compounds play a role of crystallization centers and accelerate the process of hydrolysis and hydration of clinker minerals, the formation of the crystalline structure and strength of cement composite. For the scientific substantiation of the mechanism of the effect of additives «Fosfozol» on a wide range of properties of composite cement, it is necessary to study the physico-chemical aspects of interaction of hydration of clinker minerals and minerals supplements, to establish the kinetics of hydration and the formation of the artificial conglomerate of hardening of cements with a new additive that requires comprehensive studies in this direction. Analysis of the last studies and publication. Analysis of recent researches and publications in the field of production of cement and other building materials using ash-slag and phosphogypsum showed that the ash-slag and the fine ash of thermal power plants are widely used in the manufacture of various building products: aluminosilicate as a corrective additive in cement the raw material mixture for calcining clinker, active mineral additives cement, dry mortar, wire mesh and others-concrete, wall stones, aggregates in concrete, etc [1-6]. Phosphogypsum – waste chemical industry, the chemical and mineralogical composition is very close to natural gypsum. Famous development, dedicated to getting the low-temperature sulfate cements by calcining a raw mixtures incorporating slag and phosphogypsum [7-10]. However, the presence of phosphogypsum water-soluble phosphates and sulphates limits their large-scale utilization in the manufacture of various construction products. Therefore, some researchers propose to enter into the composition of phosphogypsum variety of alkaline components, which neutralize the harmful effects of the phosphate and sulfuric acid residues on the properties of the resulting construction products by chemical interaction with them with the formation of water-insoluble compounds [11-13]. Formulation of purpose of the article: The rational solution of complex and large-scale utilization of ash-slag of thermal power plants and phosphogypsum is the organization of compact production of generic active mineral additives in cement «Fosfozol» obtained by autoclaving the mixture of ash-slag and phosphogypsum in certain mass ratios. Advantage of such supplements is that when using it excludes the costs of crushing and grinding additives on the extraction and crushing of gypsum stone, as «Fosfozol» acts as an active mineral additive and as a regulator of setting time of portland cement. Interpretation of the main material. To obtain the additive «Fosfozol» source materials were ash-slag wastes of Angren thermal power plants and phosphogypsum – waste production of wet-process phosphoric acid of JSC «Ammophos-Maxam», having a mineralogical composition given in table.1. Held in the testing laboratory research and test center «Strom» preliminary tests have proved the possibility of applying additive «Fosfozol » (laboratory batch) in the production of portland cement, as active mineral additives and controller setting time of cement instead of natural gypsum stone. To create a regulatory framework in order to formulation of this additive on industrial production, the developed Standard of the organization Ts 24249595-01:2014 «Fosfozol. Active mineral additive specifications». During the development of the standard was laid down requirements for the chemical additive «Fosfozol» laboratory party. To study the effect of additive «Fosfozol» on the physico-mechanical and physico-chemical properties of portland cement, as a matrix used portland cement clinker JSC » Akhangarancement «. The strength of cements with the addition of «Fosfozol» compared with the strength of cement with no cement PC 400 D0. mullite 3Аl2O3 .2SiO2 0,342; 0,338; 0,301..
0,253; 0,184; 0,162; 0,159; 0,158. . .
anhydride СаSO4 0,349. . .
0,219; 0,184; 0,147; 0,144. . . .
calcium hydroxide Ca(OH)2 0,262; 0,148; 0,144.. The calcium silicate hydrate (xonotlite) C6 S2 H 0,366; 0,251. . . . Preparation of samples for research carried out in the corresponding regulatory documents for each component commodity: Portland cement clinker according to the National standard of the Republic of Uzbekistan O’z DSt 2801: 2013 «Portland cement Clinker. Technical conditions»; gypsum according O’zdst 760-96 «Gypsum and anhydrite stone for production of binders . Technical conditions»; supplements «Fosfozol» TS 24249595-01:2014 «Fosfozol». Active mineral additive to cement. Technical conditions». Chemical compositions of the source materials for producing portland cement with a new additive shown in table.2. presents a wide range of clear analytical lines of products of the chemical interaction of minerals of the ash-slag and phosphogypsum: gypsum (natural, semi-aquatic calcium sulfate), hydrated neoplasms hydrocortamate and hydrosilicate structures (tab.3). The chemical activity of the additive «Fosfozol» refers to the group of artificial (man-made) aluminosilicate acidic hydraulic additives, which are known in the interaction with Portland cement, additives react with calcium hydroxide CA(OH)2, thereby increasing structural density and corrosion resistant properties of cement stone due to the formation of additional quantities of hydrosilicates of calcium (СSН). Таble 3 The mineralogical composition additive «Fosfozol» according to x-ray phase analysis. 0,315; 0,305; 0,286; 0,278; 0,259; 0,214; 0,189; 0,179; 0,153. . .
0,278; 0,232; 0,189; 0,179. .
3 Hydrocortamate calcium С3A.СаSO4.31H2O С3A.СаSO4.12H2O 0,303; 0,257; 0,242 . . .
C2SH (В) 0,329; 0,260; 0,241; 0,276; 0,189; 0,180. . .
CSH(A); C3S2.H3 0,296; 0,278; 0,274; 0,214; 0,180; 0,174,160; 0,153; 0,148. . . .
6 Dicalcium silicates α-C2S; β-C2S 0,278; 0,262; 0,215; 0,180; 0,175. . .
7 calcium hydroxide Ca(OH) 2 0,262; 0,193; 0,179. . .
To study the physico-mechanical properties of portland cement with the addition of «Fosfozol» in vitro prepared different composition of the raw material mixture (batch) with the use of portland cement clinker, additives «Fosfozol» and for comparative testing of portland cement clinker with 5% gypsum. Given the fact that the content of sulfur oxide (VI) SO3 «Fosfozol» made up 8,56%, additive in cement was injected in the amount of (15-35) %. The results of grinding Portland cement clinker with the addition of «Fosfozol» showed that with the increase in its content 15 to 35%, the grindability of mixtures is increased in comparison with the grinding of portland cement clinker with 5% gypsum. At constant grinding time (40 min), grinding fineness, is determined by the residue on the sieve № 008 cements with the addition of «Fosfozol», is in the range of (2-6) % , and the control of cement gypsum stone PS D0 — 10 %. to the number entered into the cement additive «Fosfozol» and is of 6,92 — 8,17%. It is established that the introduction of (15-35) % additive «Fosfozol» in the portland cement increases the water demand of cement paste of normal consistency from 26,15% — 29,15%, due to the high content of aluminate phases and a finer degree of grinding compared with cement PC D0. Thus, the content of aluminum oxide in the cement with a «Fosfozol» is the mass (7,00 — to 8,92) %, and without additional cement at 5,00 % (tab. 4). 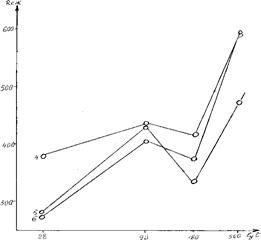 At the same time, the speed of the initial reactions of interaction with water of the cements with the addition of «Fosfozol» differ very little from the speed of reactions without additional cement. The process of starting of setting cement PC F15, PC F20, PC F25 is lengthened to (15-30) min. Obviously, this is due to the fact that the products of hydration of gypsum-containing cement with no cement (PC D0) are the compounds more soluble forms (three-sulfate hydrosult-calcium aluminate three-sulfate form), in which the crystals are formed faster, and cements PC F15, PC F20, PCS F25, a composition which contains hydro-sulfoaluminate as a three-sulfate and low-sulfate forms in optimal proportions, the setting process of cement paste is slower. In cements containing 30, 35% additives, more intense seizure coming on (15-20) min faster due to the higher content of hydro-sulfoaluminate phases. A distinctive feature of the cements with the addition of «Fosfozol» evident in the determination of end of setting time, the maximum duration of which amounted to more than 7 hours, compared with cement PC D0, with the end of the stiffening — 4 hours 25 minutes. However, it should be noted that all of the cements with the addition of «Fosfozol» setting time meet the requirements of State standard GOST 10178. According to Fig. 1, which characterize the kinetics of strength development of cement content (15-35) % additive «Fosfozol» the rate of hardening of cements PC D0, PC F15, PC F20 in time is almost identical. So, for 28 days. curing the strength of these cements meets to brand 400, and at the age of 360 days — 600. 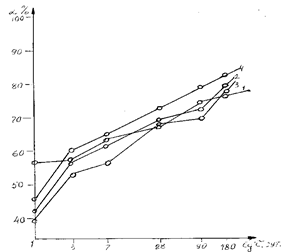 Increase the strength of cement with the additive (25-35) % «Fosfozol» is a bit of a slow nature (Fig. 1 and 2). The strength of the cement PC-Ф25 to 28 days amounted to 38.2 MPa. However, in the period from 28 to 360 days this cement aboral strength (59,8 MPa) that corresponds to the grade of 600. 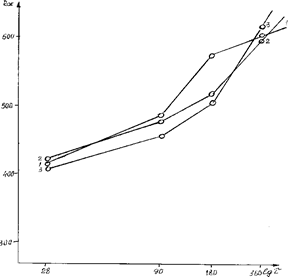 Intense set of strength of cement with addition (30-35) % «Fosfozol» is observed in the period from 28 to 90 days (Fig.3). While the strength of cements at the age of 90 days to 43,0 MPa and 41,8 MPa respectively for PC F30, PC F35. To 180 days curing the strength of cement is sharply reduced to 33,5 MPa and 37,5 MPa, which is apparently associated with phase transformation, crystallization and recrystallization of complex compounds formed during the hydration and hardening of cement with high additive content. In the further process of phase transformations is accompanied by the compaction and hardening of the cement stone structure that leads to rapid increase of strength of cement PC F30, PC F35. Therefore, the studied cement containing 35% additive «Fosfozol» (PC F35) at the age of 360 days. gains strength for 58,2 MPa. Fig. 3. The kinetics of strength development of cements with additives (25-35) % «Fosfozol» hardening from 28 to 360 days. 584, 665оС, which can be attributed to the formation of different kinds of calcium silicates after the water loss tobermorite gel. Later seal of the gel and a significant strength of hydrated grains (С2Ѕ), is firmly included in the crystalline skeleton of cement, provides a high strength cement composite, which agrees well with the results of V. V. Timashev, noting the slowing effect of the mineral С2Ѕ on the hardening process of portland cement, the more, the higher its content. The increase in strength of a system of such structures should occur continuously and more intensely than the cement stone without additives . Indeed, the growing strength of cements with optimum additive content (15-20) % in the later stages is continuous and more intensive than cement PC400 D0. According to the table. 5, the cements with the addition of «Fosfozol» the optimal composition of (15-20) % exhibit high resistance to environmental influences. So, the strength of the samples after 25 cycles of alternate wetting and drying reduced by 13,15 % in comparison with the magnitude of the indirect estimates (20-25) %. When testing the frost resistance of cements with the addition of «Fosfozol» by the standard method according to GOST 5802, after 25 cycles of alternate freezing and thawing reduce the strength of samples is not set, the value of the coefficient frost resistance equal to the value (Cfrost=1,067). Portland cement containing (15-20)% additive «Fosfozol» possess sufficient resistance to environmental influences and therefore can be used for making mortars and concretes. cycle number Rcontrol Repitemy Cfrost. Insights and suggestions. The studies of physico-mechanical, physico-chemical properties and durability of portland cement with a new supplement proved that the optimal composition are portland cement, containing (15-20) % additive «Fosfozol», which for all quality indicators meet the requirements of GOST 10178-85 «Portland cement and slag portland cement. Technical conditions». In order to obtain high-quality plus the portland cement, characterized by high physical-mechanical and technical properties, the contents of this Supplement, according to its chemical composition and other characteristics to the requirements of the Standard of the organization TS 24249595-01:2014 «Fosfozol». Active mineral additive to cement. Technical conditions», should be limited to 20 %. The phase composition of hydration products of cement with addition of «Fosfozol» hardly differs from the composition of hydration products of cement with no cement the hydration of cement during the initial stages of hardening are formed of crystalline and gel-like products that are hydro-sulfoaluminate and weak-base calcium hydrosilicates. The degree of hydration of the cements with the addition of «Fosfozol», in comparison with the clear cement is lower only in the initial period of hardening. At a later date the degree of hydration of cement with the additive and without additive is almost the same. Contained in «Fosfozol» products autoclaving, acting as centers of crystallization, define the processes of hydrolysis and hydration of hardening cement dispersion. Due to the fact that the supplement «Fosfozol» consists of sulfate minerals, and also contains hydrated neoplasms of hydro-sulfoaluminate and hydrosilicate structures, when it is used to regulate the setting time in cement gypsum is not entered. Pulatov Z. P., Mironyuk N. A. Makhmudova N. To., Kozlova I. G. The use of ash-slag and fine slag TPP in the production of dry construction mixtures // Uzbek chemical journal. — 2010. — №. 1. — P. 62-65. Pulatov Z. P., Mironyuk N. A., Makhmudova N. K., Ganiev, H. G. Integrated use of ash-waste of thermal power plants during the production of clinker and Portland cement // Uzbek chemical journal. -2010. — №. 5. –P. 48-50. Pulatov Z. P., Adylov D. K., Makhmudova N. K., Mirzaeva, L. Z., Ganiev, H. G. Use of ash and slag and fine slag waste TPP in the production of chemically bonded brick // Uzbek chemical journal. -2010. — №. 2. -P. 45-50. Pulatov Z. P., Iskandarova M. I., Ganiev H.G., Kakurina L.M., Chernysheva, G. P. Resource-saving technology of complex use of ash-wastes in the production of lightweight concrete // Composite materials. — 2010. — №. 3. -P. 36-39. Pulatov Z. P., Iskandarova M. I., Ganiev H. G., Myronyuk N.A. The impact of ash- wastes Angren thermal power plants on the properties of portland cement // Composite materials. -2010. — №. 4. -P. 32-36. Alinazarov A. H., A. G. Gulyamov Formation properties in ash-cement compositions polystructural structure // The solar engineering. Edition.1. -2003. -P. 86-88. Ruziev N. R., Iskandarova M., Negmatov S. S. etc. Technological bases of obtaining of low-temperature sulfo-alumino-ferruginous cements // Composite materials. — -2008. – №. 4. -P. 47-50. Makhmudova V., Iskandarova M., Ivanova Y., Chernov G., Ruziev N. Sunthesis and properties of sulfhoferrite calcium clinkers and low temperature cements on their basis // Jornal of Chemikal Technology and Metallyrgy. -46. -2. -2011. -151-154. Iskandarova M.I., Negmatov S.S. Atakuziev T.A. Negmatova M.Y. The low temperature technology of sulfoalumoferruteros cement resursion on a basis of sulfate ferry ferrous waste products and row materials of Uzbekistan //15- Internationale Baustofftagung. -F.F.Findev-Institut fur Baustofkunde. -Bauhaus Universitet. -Bundes Republic Deutschland. -2003. -Р.1-0749-1-0755. Atabaev B. F., Iskandarova I. M., Pulatov Z. P. The technology of producing non-fired bricks based on neutralized phosphogypsum // Collection article 1 — scientific-practical seminar with participation of foreign experts. Tashkent, November 9-10, 2011. –P. 163-167. Ismatov I. S., Pulatov Z. P., Iskandarova M. I., Myronyuk N..Properties of cement composite material with the addition of modified phosphogypsum // Intern. Scientific-technical conference «New composite materials based on local and recycled materials». -Tashkent, 5-7 may 2011- P. 157-159. M. Iskandarova, F. Atabaev B., L. Z. Mirzaeva. Utilization of phosphogypsum in the production of wall plaster materials and products //Uzbek chemical journal. — №. 6. -2013. — P. 47-50. Atabaev F.B., Mironyuk N.A., Iskandarova M.I. The production technology of the modified phosphite and its application by production of portlandсements // PPM-2015. International POROUS POWDER MATERIALS. — CESME – IZMIR /TURKEY. 15-18 сентябр. -2015. –Р.326-330. Timashev V.V. Selected works. Synthesis and hydration binders materials. -M. -«Science». -1986.